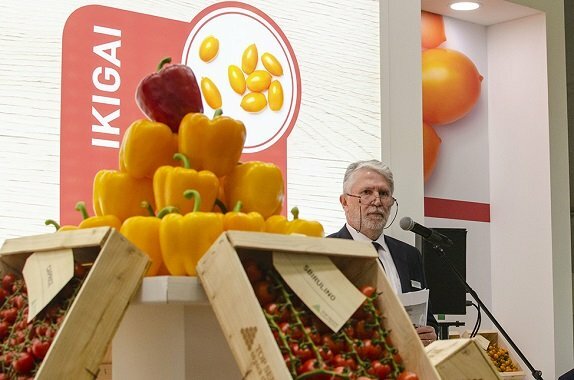 Top Seeds International was taking part for the first time in the most important international fresh produce exhibition in Berlin from 6-8 February 2019 with a presence in two separate locations: an institutional space (Hall 1.2 – B18) where it was showcasing its many resilient and profitable varieties including tomato, pepper, cucumber, aubergine, melon and watermelon; and a stand devoted to new brands (Hall B – City Cube C04). The two brands were unveiled at two meetings held at the company’s stand in the City Cube on the first two days of the show and reserved for the press and international fruit and vegetable sector experts. Talks were given by Gianni Bernardotto, CEO of Top Seeds International, and Tetsu Watanabe, General manager of AgriScience Division – Mitsui & Co Ltd. At the end of the meetings, participants had a chance to taste the varieties sold by Top Seeds International.